Simla mirchi ka Raitha- It is a very tasty Raitha & best accompanied with any kind of paratha or Biryani. Take a bowl ,add chopped peppers, cilantro,onion, chillies & salt. Add yoghurt & mix well. Heat oil in pan, add mustard seed & allow to tempering & add to the Raitha. 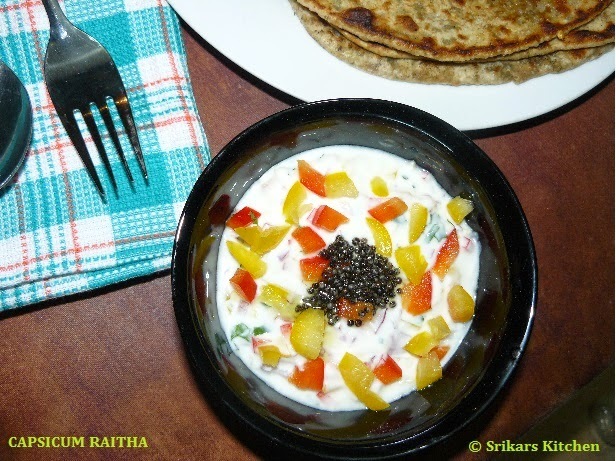 Very colourful and delicious crunchy raita..